To celebrate the launch of the gorgeous new Candy Swirl yarn cakes, from Stylecraft, I have designed this beautiful, cosy, shawl. The name Candy Swirl, started “Allsorts” of ideas racing round in my head, I started to think of sweets from my childhood, what could I “Maltesers” you all with, that wouldn’t cost you a “Penny Chew”, there was a “Galaxy” of “bon-bons” to choose from…hehehe “snickers”. I knew I had to play it “smartie” to find the right stitches, so here is the “kinder surprise”. ♥ This is a FREE pattern ♥, you can download a pdf here Bubble-Gum Shawl, or follow the pattern from this page. There is also a video tutorial to help you. 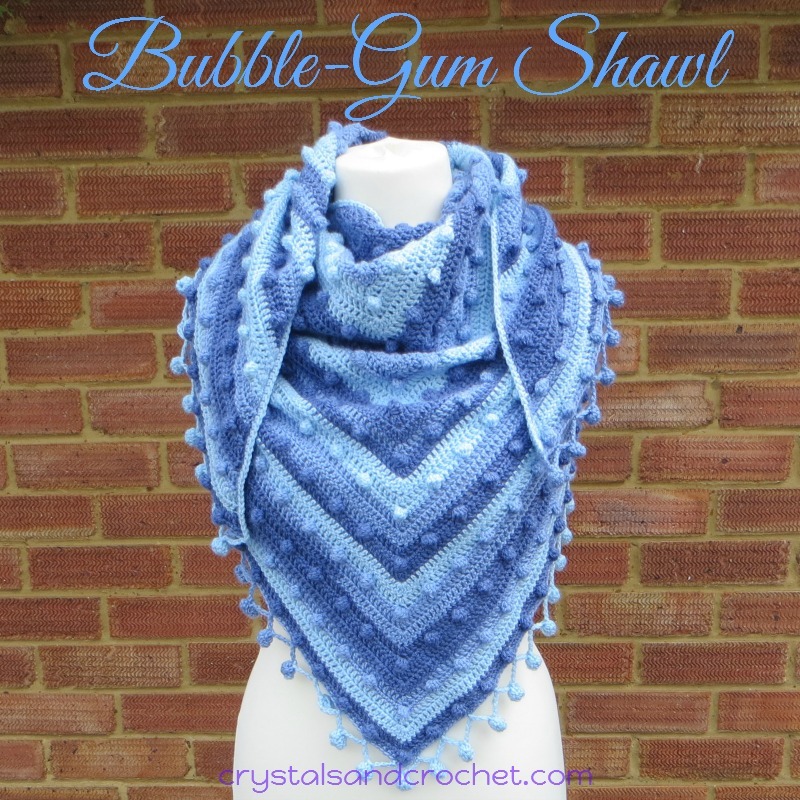 ♥ The Bubble-gum shawl is a very simple pattern repeat, using US terms Double-Crochet and Bobble stitches, and a fabulous bobble border, designed to be made with Stylecraft Candy Swirl double knit yarn, using a 4mm hook. ♥ You will need 3 Candy Swirl cakes in your chosen colourway. ♥ I used Blueberry Gum, as I wanted to wear mine with jeans, for a casual but glam look. Yarn Packs, available in My Deramores Shop. The pack includes 3 cakes of your chosen colour way, there is a drop down box for you to choose. And also at Woolwarehouse. and Loremar. But you can also use any yarn or colours you like. Most of my testers used Stylecraft Special Double Knitting, with a 4mm hook. The maximum amount of yarn used was 1500 meters/1640 yards. Bertha made a smaller version for her 7 year old grandaughter, with only 8 repeats, but using worsted/Aran weight yarn and a 6.5mm hook. Kathy made hers with Hobby Lobby I Love This Yarn and a 5mm hook, 1508 meters/1649 yards. Finished size: 76 inches across and 40 inches deep. Bobble Stitch: make a dc5tog cluster. In indicated stitch, make 5 partial dc’s, yarn over and pull through all six loops on hook. The bobble is formed as you make the next stitch. Beginning Bobble Stitch: In indicated stitch, ch 2 and make 4 partial dc’s, yarn over and pull through all 5 loops on hook. The bobble is formed as you make the next stitch. Starting with a magic ring, ch 3 [counts as dc], 6 dc in to ring. Place stitch marker in 4th dc [point st]. Hint: continue to move stitch marker to point st in each row. WS. Ch 3, turn, dc in 1st st, dc in next 2 sts, 5 dc in point st, dc in next 2 sts, 2 dc in top of ch-3. RS. Ch 3, turn, 2 dc in 1st st, dc in next 5 sts, 3 dc in point st, dc in next 5 sts, 3 dc in top of ch-3. Hint: bobble rows are always worked on wrong side. 1. Ch 1, TURN, 2 sc in 1st st, sc in next 2 sts, (bobble in next st, sc in next 5 sts) repeat to point st, in point st (2 sc, bobble st, 2 sc), (sc in next 5 sts, bobble in next st) repeat to last 3 sts, sc in next 2 sts, 2 sc in top of ch-3. 2. Ch 3 [counts as dc], TURN, 2 dc in 1st st, dc in next 3 sts, (dc in next bobble st, dc in next 5 sts) repeat to 2 sts before point bobble, dc in next 2 sts, 3 dc in point bobble st, dc in next 7 sts, (dc in next bobble st, dc in next 5 sts) repeat to last bobble, dc in last bobble, dc in next 3 sts, 3 dc in last st.
3. Ch 3 [counts as dc], TURN, dc in 1st st, dc in each st to point, 5 dc in point st, dc in each st to st before last, 2 dc in top of ch-3. 4. Ch 3 [counts as dc], TURN, 2 dc in 1st st, dc in each st to point, 3 dc in point st, dc in each st to st before last, 3 dc in last st.
Continue with pattern repeat rows 1 to 4, 14 more times. Hint: your bobbles will all line up as you increase, and each repeat increases by 2 bobbles per side. Repeat row 1 Bobble row. stitch count: 198 sts per side. Ch 1, TURN, 2 sc in 1st st, sc in each st to point, 3 sc in point bobble, sc in each st to end, 2 sc in last st.
Stitch count: 200 sc per side, plus point sc. Hint: keep your sl-sts loose to stop your edge curling. Ch 1, working along long edge, make 1 sl-st in each sc, and 2 sl-sts in each dc, sl-st in centre ring, and repeat to end, ch 1 and sl-st into top of sc. Ch 4, make a beginning bobble st in 4th ch, and make a 2nd beginning bobble sit on top of 1st, fold in half with right sides together, sl-st into 4th ch, sl-st into 1st ch of 1st beginning bobble st, ch 4, skip 5 sc, sl-st in next st, repeat around, making final sl-st in last st. Hint: at point sl-st will be 3rd st before point st and 3rd st after, still skipping 5 sts. Ch 1, and working into ch-1 before 1st sl-st, and each sl-st, sc to end. Fasten off, and work away ends. I just wanted to say thank you for your wonderful designs. I’ve done two Mandala Madness patterns and today I was struggling to find just the right pattern for some new yarn and wa-la! I see your Bubble Gum Wrap…..it’s perfect! You’ve made my day. Keep up the great work! I love the bubble gum pattern but would love to make a poncho with this patter have you done one ,I am a newbi at crocheting so can’t work out how to do it . Hi, while waiting for wool I practised the pattern and noticed that the approx size was not on the pdf but found in the article. Also I feel that it would be handy to have an approx size early on, say after first pattern complete. Other than these minor points I found the pattern excellent and the video tutorial brilliant. I shall certainly be telling my friends!